Fairly big news coming out of Docomo, though some of this is still rumor. They're adding a 24 hour free talk plan, dropping the price of tethering, and (apparently) going to be selling the next Nexus phone. Pretty significant stuff. On the down side, the price of tethering is still high, Xi voice plans will be more expensive than the competition, and Xi data caps will be applied within the next year. Xi pricing and plans have been revised far more times than the number of years Docomo has had an LTE network. On the one hand, Docomo says data will be capped, but on the other they say it's unlimited. Don't bother asking at a shop for clarification, as I did just this last weekend because the staff apparently don't know either. Finally, we have a Docomo web page that clearly and consistently explains the pricing. We've been hearing rumbling that Docomo intended to introduce a voice plan to compete with AU and SBM. I guess Docomo was able to ignore the SBM's White Plan until AU offered the same plan for the same price - free calls to from 1 am to 9 pm to subscribers on their networks for ¥980/month. The base Xi voice plan will now be ¥780 with a 2-year contract, but this will include zero free air time. Without a 2-year contract the price will be ¥1,560. A calls to family members are free with a 2-year contract. The most interesting part is the "Talk 24" plan. For an additional ¥700 you get free calls to Docomo subscribers 24 hours/day. In the case of a 2-year contract, this totals ¥1,480 and will be a great deal if you call a lot of Docomo folks. The Campaign price of ¥4,410/month buys unlimited data until 5/1/2012, after which the price increases to ¥5,985. However, from 10/1/2012, Docomo will introduce the 7 GB cap. exceeding it gives two choices: 128 kbps or an additional 2 GB for ¥2,625. There is also a tiered plan, but it such a bad deal, I can't in good conscience link to it. Correct me if I'm wrong (and someone always does), but I was under the impression that part of the philosophy behind the nexus project is to present a pure android device to consumers - a check on the aspirations of carriers who might want to "differentiate" Android too much, and not for the right reasons (from a consumer's point of view). Docomo will charge a premium for 3G data. So a Docomo-branded version must be LTE. SIM unlocking in Japan has been a huge let down because Docomo, who ironically championed the the whole thing, barred unlocked phones from their network by charging an exorbitant price for data: ¥10,395. They've finally come to realize this is way over priced, so they're dropping it down to ¥8,190, which is still way too expensive. 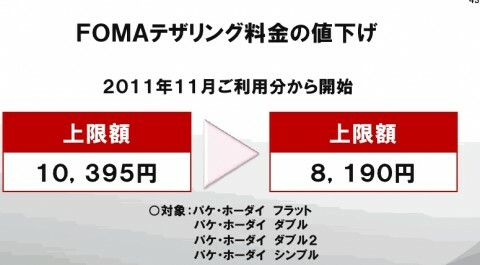 It also appears that Docomo will drop their FOMA data plan price from down under ¥5,000. >Really? A Docomo Nexus? I've always considered the two mutually exclusive. >If this is happening, then it must be an LTE handset for Xi. Here's why. 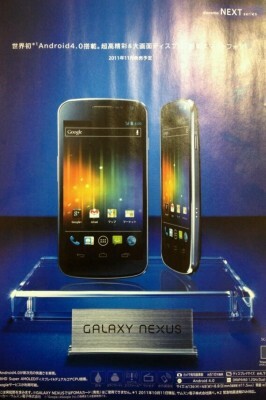 You can see in the attached docomo smartphone catalog that the Nexus is not in the Xi column. We should know officially soon enough after the Android event in HK today. So does this mean Google is going to lock the bootloader on the Docomo Nexus? Has Google shipped Nexus handsets that couldn't have the bootloader unlocked? All N1s had unlockable bootloaders. Can anyone confirm the same for the NS? The idea of a phone with a factory unlockable bootloader is incompatible with Docomo's irrational fear of anything that might be remotely capable of tethering. A locked down bootloader is incompatible - or at least I thought it was - with google's nexus philosophy. I heard rumors that the other versions not just the Docomo one will have a locked bootloader. Not that that will stop anyone but it really goes against my philosophy and that of the "Nexus" branding. Hopefully the next one will be a Motorola and Google will have it completely unlocked. I am guessing whatever they give out at Google I/O will have an unlocked bootloader. > drop their FOMA data plan price from down under ¥5,000. means, ¥4999? Any news on this? Given the Nexus is Penta-band maybe it will support Emobile ! Don't count on it. emobile's 1700MHz band is band IX, while I'd be willing to bet the Nexus's 1700MHz band is band IV.